There are lots of useful and funny engineering gadgets and other trinkets. Most of these are also profitable to create, as rarely do engineers sell other than high end creations, with pets being an exception. Flashlights are however a level 50 item. See your auction house if there's none for sale, and grab the market for yourself - temporarily at least! Flashlights have same use effect as Elune Stones. 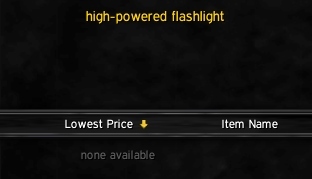 Not only is it cheap to create High-Powered Flashlights, but trinkets have always been equips that sell the fastest from my experience. Most players have empty trinket slots, even though Cataclysm added some trinkets to quest rewards. Still, these are blue quality and offer the most important stat in the game: Hit rating. Even though they are Unique-Equipped, often a single person purchases two of them. It's a good idea to sell multiple of these items, but no more than 3 at a time. Thorium Widgets require 3 x Thorium Bar and 1 x Runecloth. If you have mining, it's often more profitable to purchase Thorium Ore instead, and smelt it. Even the larger realms have usually zero sellers, allowing you to choose freely how much you charge per High-Powered Flashlight. However, I wouldn't go above 300 gold. Experiment with the prices to see how you make sales the fastest. I can see the value of this as a vanity item, but surely your market would be very small? You'd have to (at best) bark this and depending on price, you might just attract competition this way. It might be more viable with the new levelling Pandas in a couple weeks, but again, the market would be very small I'd think. A fun novelty item that (thankfully) doesn't require engineering to use, but still a really limited market I'd think. Well, on a larger realm you rarely have to relist the item if you're the only seller and the price is fair. There's lots of people leveling new alts now that there's new talents and stuff. For those that have 85 mains, trinket heirlooms take a lot of time to farm, and justice could be spent on main's gear instead. Also, there's no harm done if you sell stuff that is more expensive than it took to create. Your post remind me for [Elune's Lantern] that creates [Elune Stone].